If you’ve never played a serious survival horror game before, Human Head Studios’ Lost Within with frighten you. If you have, at least you’re on familiar ground. 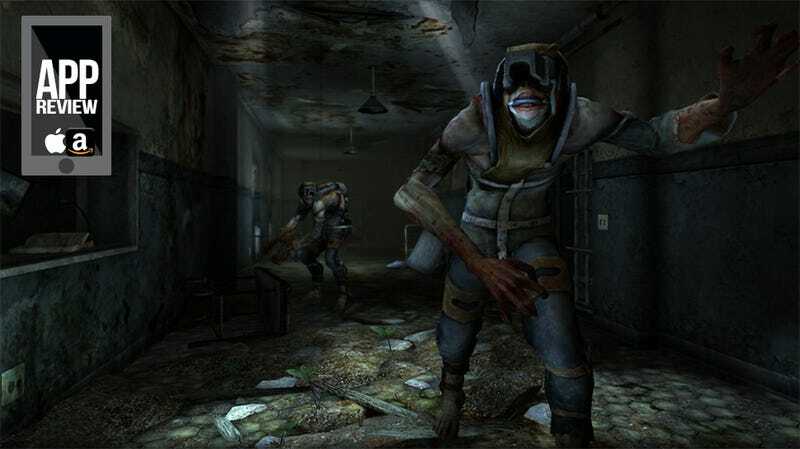 Despite being a terrified kitten in the face of most of the survival horror genre, I’ve played enough that a run-down mental health facility just doesn’t do it for me anymore. My first steps through the dilapidated Weatherby Asylum were less creepy and more homecoming. I felt like I’d been there before. In a way I had. Madness and horror often go hand-in-hand, and for good reason. As far as realistically scary things go, the thought of losing one’s mind is pretty high up on most people’s list. Trapped inside your own body, Lost Within your own mind, if you will. It’s a concept that almost doesn’t need the added supernatural trappings Human Head’s game gives it. Or maybe it doesn’t have them at all. Yeah, it’s that kind of story. The first chapter of the game focuses on a policeman investigating reports of trespassers at Weatherby. The asylum is set to be torn down, and he’s to make sure no one is lingering in the building before it’s demolished. Guided by the voice of a small boy, the policeman finds himself hiding, sneaking and fighting for his life against seemingly supernatural forces that haunt the crumbling halls of the hallowed institution. Lost Within features all the hallmarks of a good horror adventure. Whispering voices, scrawled graffiti, relentless enemy creatures that can’t be killed by conventional means, indicated by guttural growls and the shuffling of feet in the darkness. I imagine a newcomer to the genre—the sort picking this up on iOS or the Amazon Kindle Fire HDX (which I played on) would find it downright terrifying. I appreciate the construction of Lost Within. I enjoy the ease with which my character navigates the well-rendered corridors, tapping to move, double-tapping to sprint. I enjoy the simple crafting system, allowing me to make health packs and tasers and other odds and ends to assist me on my journey. And I enjoy the journey itself. The story Lost Within tells is quite twisted, and just when I thought I’d figured it all out, along comes the end of part one and the beginning of part two, at a point some two and a half hours in when most mobile games of this caliber would be wrapping things up. As an adventure game, it’s quite impressive. As a survival horror game? It’s okay. There’s a bit too much hand-holding for my tastes—interactive items and documents scattered about the levels pulse with a game-y glow, taking me out of the experience. Rather than letting me wander aimlessly through the halls, the game is constructed almost like a puzzle adventure game—here is a small series of hallways, with monsters here, here and here. Get past them and its on to the next level. Once I began to envision its structure, the game felt a lot less urgent, a lot less tense. I envy the new-age gamers Amazon Game Studio and the developers of Prey seem to be gunning for with Lost Within—the more casual mobile gamer, hungry for something that’s a cut above the normal free-to-play fluff. The sort of folks who’ve never wandered through the foggy streets of Silent Hill or shot pictures of vengeful spirits with shaky hands in Fatal Frame. They’re about to be introduced to a world of horrible wonders. I imagine their hearts racing as they dive into a locker, twisted creatures made from madness clawing at the metal to try and reach their flesh. They’re going to have so much fun with this. Free from the distraction of Lost Within’s horror show, I’m free to appreciate another well-crafted mobile game from Amazon Game Studios. Between this and Tales From Deep Space, its making a name for itself as a publisher of console-quality, microtransaction-free premium mobile games. Verdict: While survival horror veterans will find themselves in familiar territory, Lost Within’s compelling story is enough to see them through to the bitter end.